Before the NFL season began, the L.A. Rams were already loading up for a deep playoff run – and possibly a Super Bowl appearance. A dream that was realized last Sunday, when Greg Zuerlein booted a 57-yard game-winning field goal in overtime, sending the Rams organization to their first Super Bowl since 2001. 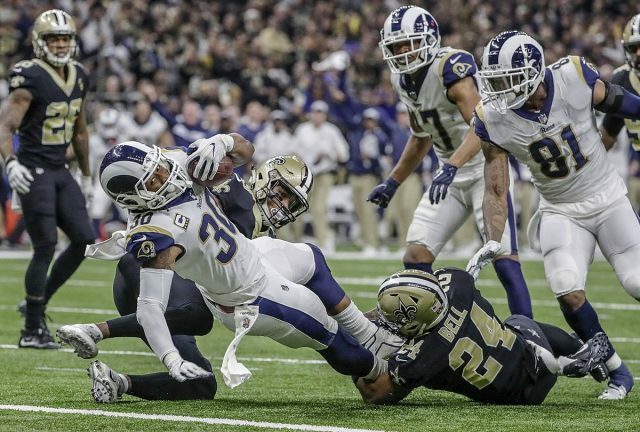 During last year’s offseason the Rams were the most active NFL team in free agency and within the trade market, acquiring All-Pro cornerbacks Aqib Talib and Marcus Peters, star wideout Brandin Cooks. They later added ex-Jaguars pass-rusher, Dante Fowler to the roster at this past trade deadline. All four of these players have had huge impacts on the Rams season, with Cooks being one of Jared Goff’s favorite targets and all three defensive players playing huge roles in moving onto the Super Bowl. They signed one of the top defensive tackles Ndamukong Suh, who has partnered with Aaron Donald in creating the most ruthless defensive line in the league. They also signed center John Sullivan, who, along with left tackle Andrew Whitworth, has anchored the offensive line and protected Goff all year long, along with opening holes for Pro Bowl running back Todd Gurley. The Rams were perennial favorites heading into the season, and they have lived up to the hype up until this point. Now, they must face one more test. The Goliath of the sports world – the New England Patriots. New England has been driven by the underdog mentality throughout the postseason so far, most recently in their stunning victory over the Kansas City Chiefs in the AFC title game on Sunday. However, Vegas has New England favored in Super Bowl LIII; thus diminishing the whole underdog feel to it. Could this bode well for the Rams? Or is it too late to keep down the class of the NFL?